When my dad was flying his RC planes back in the 70's there was no alternative to IC engines, no other power method could provide enough flight duration or thrust to even be considered. Needless to say that he was quite impressed when I showed him that none of my planes or helicopters use fuel, I have a dozen of batteries and that gives me a good morning of flight. Technology is quite impressive, and this particular innovation is, in my opinion, the main reason for the radio control hobby to have become so popular all over the world. 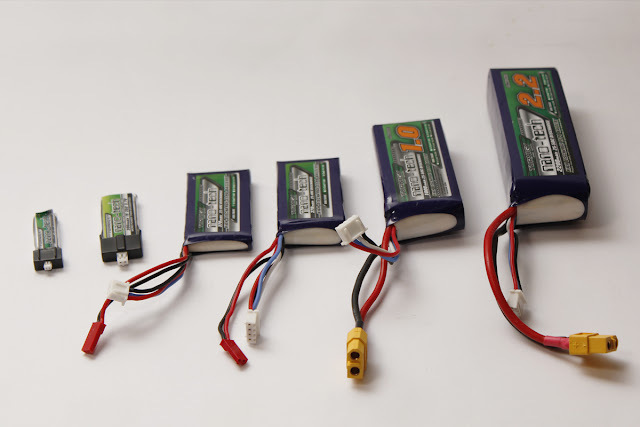 "Lipos" (friendly term for Lithium - Polymer battery) are now widely available both on internet and at local hobby shops, and they are offered at a great range of performances and prices. They have large capacities, up to 12.000 mAh, which means large amount of power with marginal weight. Their internal resistance is very low, which translates in high discharge capacity, which again means that a lot of power is available at any given time. LiPo batteries do not last as long as other batteries, such as NiMH or NiCd, a rough estimate gives around 300 charge / discharge cycles before the battery's internal resistance increases to a point where they cannot erogate a sufficient amount of power. They are considerably more expensive than other batteries, but the price is going down everyday. Due to the nature of the electrolyte used in these batteries, which is very volatile, there is a concrete risk of explosion or fire. LiPo batteries are very susceptible to good care: if you do not follow the rules it is very likely that you will have an unusable battery very soon. 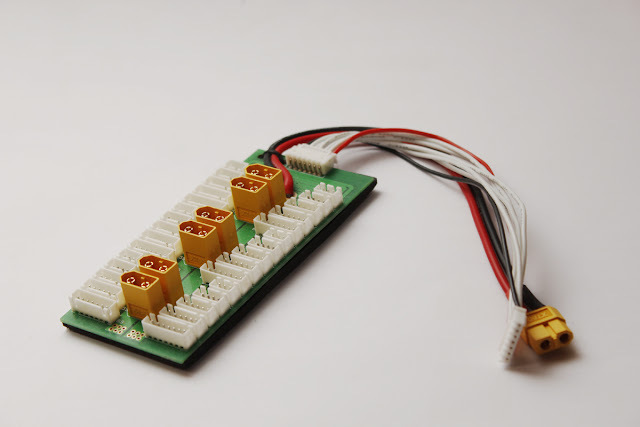 LiPo cells have a nominal voltage of 3,7V. This is a good advantage compared to NiMH cells as they are at 1,2V and some micro airplanes and helicopters will need only one cell to fly. Usually a fully charged cell is at 4,2V. Ok, so your motor need a 3S LiPo battery. What does this mean? It only means that the required battery is made of 3 cells in Series. Going back to physics class at high school you might remember that if you connect two or more batteries in series their total voltage is the sum of the single voltages. 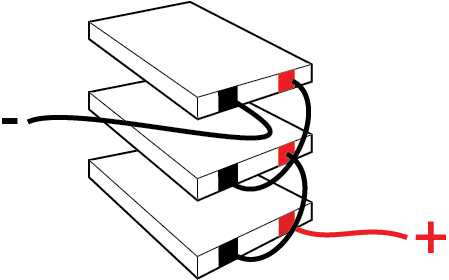 Therefore your 3S battery will be nothing else but 3 single cells connected in series to reach the required voltage. (3,7V + 3,7V + 3,7V = 11,1V). To understand what the voltage is you can think at a tank of water, the bigger the size of the hole, the more water can come out at any time. Another number written on the battery is followed by mAh, which means milliamper/hour. This can vary from as little as 70mAh to an impressive 12.000mAh. This is the capacity of the battery. To go back to our tank of water, the capacity is the size of the tank itself, the bigger the tank, the more water it can contain. By connecting batteries in parallel you will keep the voltage the same (size of the hole of the water tank does not change) but you will sum up the total capacities. (1000mAh + 1000mAh + 1000mAh = 3000mAh). 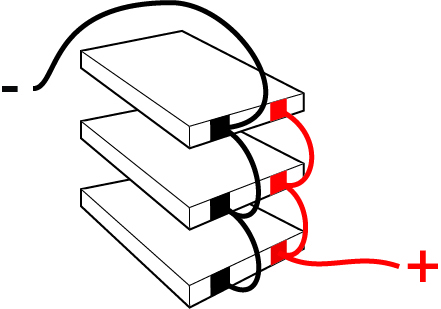 3 cells connected in parallel, their total capacity (Amps) is the sum of the single capacities, their voltage is the same as the voltage of a single cell. You probably will have noticed that LiPo batteries have another value, followed by a capital C. It can varies from 10C up to 90C. This value indicates the discharge rate of a battery. The higher the number the better the battery is, and the more expensive it is as well. As an example, let's take our 3S 1000 mAh battery. Which, for example, is rated at 25C. This means that you can safely discharge it at 25 times it capacity (1000 mAh x 25 = 25.000mAh). Pulling such a load would deplete our battery in a bit more than 2 minutes, but this is quite an uncommon case I would say. To calculate the time there is a pretty simple formula: first, determine the mA per minute of the battery (1000 / 60 = 16,6), then multiply this value by the C rating (16,6 x 25 = 416,6) and finally divide this number into the total capacity of the battery (1000 / 416,6 = 2,4 minutes). Sometimes you will find that batteries display two C ratings, say 25C - 50C. This refers to a maximum allowed discharged rate for constant use (the first value) and a "burst" rate, which refers to the maximum discharge rate for limited amounts of time, about 10 seconds or so. This is the main reason I am writing this article: I see many people confused when they want to charge many batteries at once and do not know how to approach the matter. This is the charger I use, I purchased it for less than $20, and it charges, discharges, store and balances up to 6 cells LiPo batteries. Well, to charge multiple batteries at once means to charge them in parallel. To do so you will first need a parallel board. Then you will need a LiPo charger and a balancer. Nowadays the majority of charger have a built in balancer which takes care of leveling the voltage of each cell within the battery to make sure they are at the same level. Connect the balance plugs to the parallel board first. 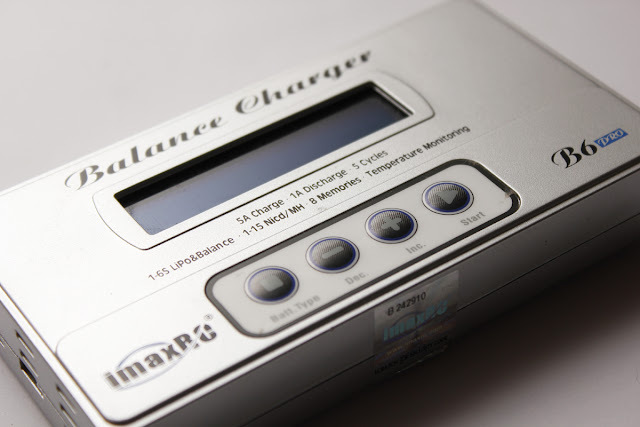 If the batteries are at a different charge level, leave them with the balance plug connected for at least 15 minutes, with the charger off. This will allow all the cells within all the batteries to equalise. Set your balancer / charger to correctly charge the batteries and...wait until it's done! This is a cell monitor, it quickly tells the voltage of each cell and of the total battery. Incredibly useful at the field to determine which battery has already been used. 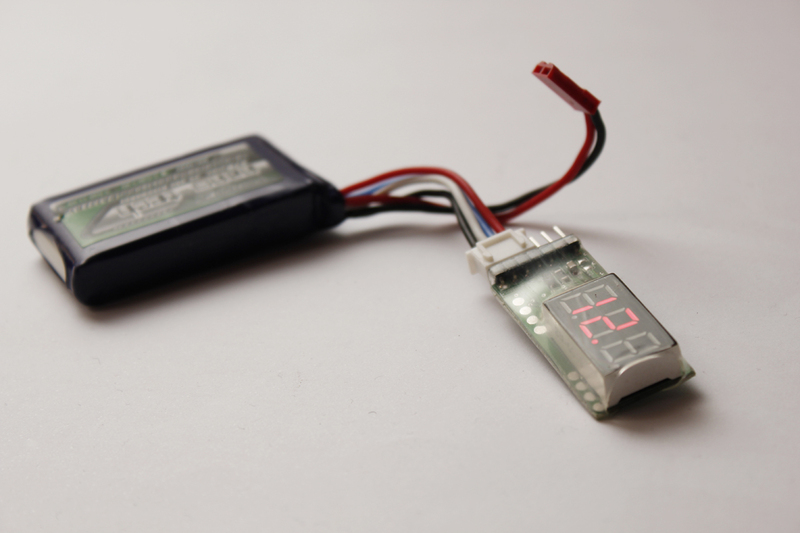 The safest method to charge LiPo batteries and the one that will prolongue their life the most is to charge them at 1C. Bringing back our 3S 1000mAh battery, charge it at 1C would mean set the charger to fill the battery at 1000mAh. If we were to charge it at 2C (which is thought to be safe with quality batteries) we would set the charger ar 2000 mAh, halving the charging time. Never, EVER, use more than 80% of the capacity of the battery. This will kill the cells and make them unusable. If you plan not to use your batteries for a prolonged amount of time, the best thing you can do is to partially discharge them to a safe level, which is around 3,85V per cell. Usually chargers have the possibility to automatically prepare the batteries for storage. Do not leave LiPo batteries unattended when charging them, it is dangerous. If you crash and your battery inflates leave it alone for at least 20 minutes, put it in a fire proof box and dispose of it properly, it is dangerous.